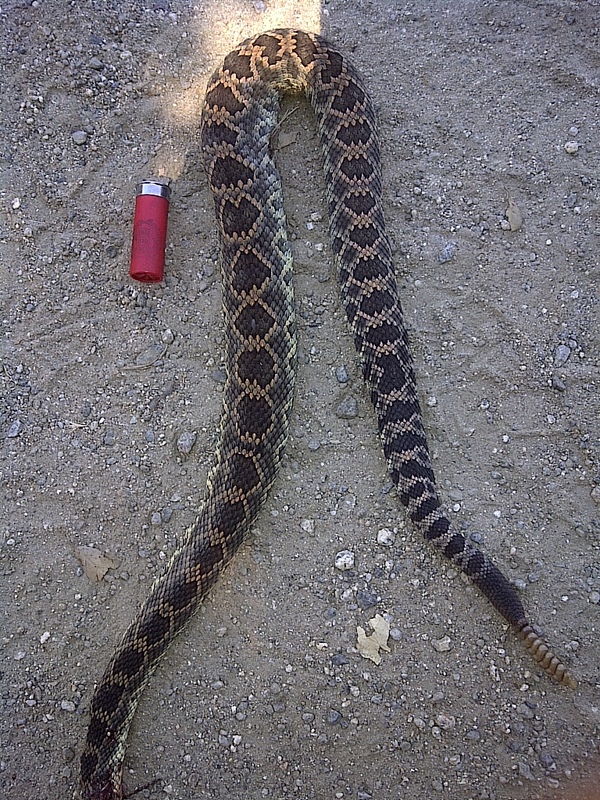 This rattlesnake is the same snake from my Rattlesnake Soup Recipe. That day I promised my wife I would make her a wallet from the skin. 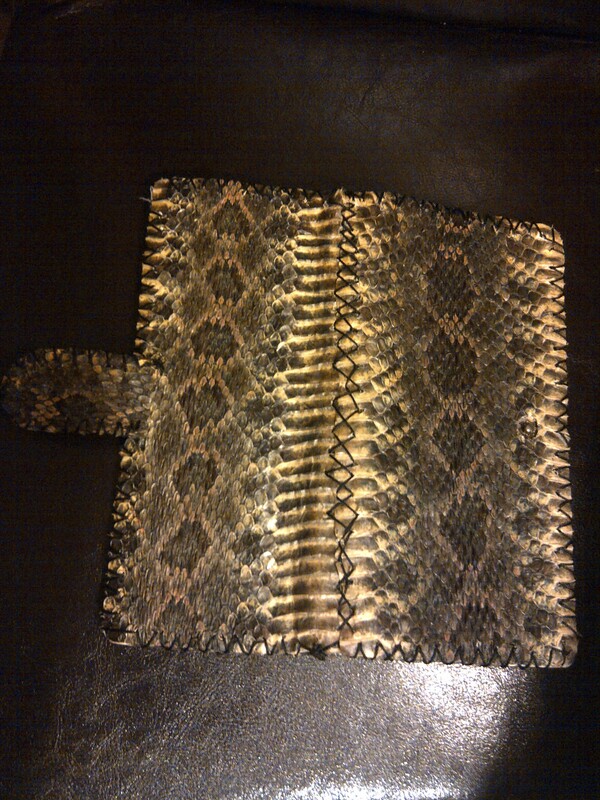 I tanned the hide but never actually made the wallet until about a week ago. I will cover the tanning of the hide in this article. The tanning of the skin follows traditional tanning practices as they relate to the fleshing and stretching of the skin. I added a little twist using eggs to replace the conventional tanning solutions which require you to soak a hide for several days. The egg wash will allow you to save some time on the whole process. The enzymes in the egg perform similarly to those found when the hide is tanned using the brain. Prepare to complete the fleshing, stretching, and tanning process in one day. You cannot let the skin set for long during the process or it will dry out. I did cut the rattle off of my snake when I cleaned it. To preserve the rattle, submerge the fleshy tip in salt and let it sit for about a month. I recommend completing this process as soon as you separate the skin from the meat. The first step is to flesh the hide. You are basically going to scrape any fleshy material from off of the skin. I used a 2â€ x 6â€ piece of wood flipped on its edge. I would position the skin perpendicular to the edge of the wood and focus on that small exposed section. It is better to work from the center outwards. I used a dull knife for my scraping tool. You do not want to cut the skin so keep the knife near to 90 degrees as you scrape. Your basic motion will be to repeatedly scrape until you move the fleshy material to the outer edges of the skin. Maneuver the skin any way you can to get the last bits from around the edges. Be careful not to rip the skin on the outer edges as you scrape. It is very important to remove all of the fleshy matter from the skin otherwise it will not tan properly. Once all the flesh is removed then you are ready to stretch the hide. You will need a flat piece of wood that is slightly longer and wider than the skin. I used the same 2â€ x 6â€ piece of wood from above. 1)Â Â Â Â Â Place the skin scale side down on the center of the board. 2)Â Â Â Â Â Place two pins on the both sides of the skin near the center. The pins should be about 1/8â€ from the edge of the skin and about 2â€ apart. 3)Â Â Â Â Â Select one side to work with. 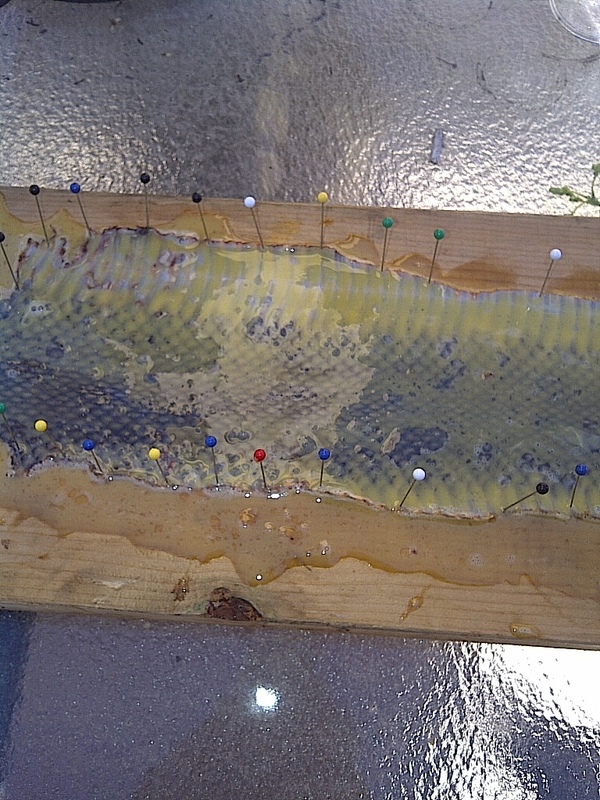 Slightly stretch the skin away from the center pins and pin the whole edge. 4)Â Â Â Â Â Grasp the middle of the skin between the outer pins and the center pin. Stretch slightly and pin. Following the same pattern on both sides. 5)Â Â Â Â Â Now, fill in the gaps, as you stretch, centering each pin between two opposite pins until all pins are approximately 1â€ â€“ 2â€ apart. 6)Â Â Â Â Â Pin any edges that curl up. You want everything to be flat and stretched. 7)Â Â Â Â Â Repeat step 2 â€“ 6 on the opposite side. Once the stretching process is complete you are now ready to tan the hide. I was taught that you use one dozen eggs for every pound of brain weight of the animal whose hide you are tanning. There is no way a snakeâ€™s brain weight close to a pound so I only used two eggs. If you are using a smaller snake then only use one egg. Crack the eggs, put them into a bowl, and mix them like you were going to scramble them. Make sure the yoke and the egg white are thoroughly mixed. Take a clean paint brush and brush on the entire amount of the eggs onto the skin. Make sure you cover the entire skin. Overlapping mixture onto the board is okay. The skin will absorb some of the egg mixture but you will find that there will be a thin layer on top of the skin. Place the skin somewhere safe (away from critters and people) so it can dry. I placed my skin in direct sunlight and then let it rest overnight under my covered porch. Once it has completely dried it will be stiff with no standing liquid. You will find a thin dry yellow layer of the egg wash on top. Now it is time to break the skin. This part of the process is undoubtedly the most labor intensive. It took me several days to complete this part because I would have to rest between sections. Do you remember that yellowish substance on the top of the skin? You are now going to break it all loose by working the skin back and forth. The basic motion would be described as folding the skin in half between you two hands (scale side down) and rubbing your hand together together to break loose the dried egg wash on the top of the fold. The concept behind this method is that you are breaking the fibers loose in the skin making it pliable. Follow this method using different angles and folds until the entire skin is free of the egg wash. It sounds simple in method but it is time consuming. Take your time to ensure you complete the process in its entirety. Donâ€™t be worried if some of the scales loose a clear covering. My snake was close to shedding so there were many of the clear scales which came off of the skin. Once this step is complete you hide is tanned. I stored mine rolled up in the closet for about a year until I was ready to make the wallet. When I pulled it out from storage the skin appeared to be in the same condition. It didnâ€™t smell or rot. Good sign. There are several things you could do from here. You could glue the skin to a board and mount it on the wall or use a portion for a hat band. The skin will easily cut with scissors. I ended up making a wallet for my wife, as promised. Wow, I had no idea I could do something like this at home! Does the same processes work for mammal hides? Yes, you would use one dozen eggs for every pound of brain for the selected animal. The only difference would be the stretching of the hide. You would use a wooden frame large enough for the hide and rope to attach the hide to the frame. Mammal hides will come out very soft using the eggs as a tanning method. Ben, thanks for the comment. I basically used an old leather wallet, removed the stitching, glued the rattlesnake skin to the outside, and restitched it back together.